The assignment : Create an outdoor interactive kiosk for people visiting Montreal public spaces where, by reading, they can unlock an immersive experience of a legend recounting the creation of the world in music and Wuxia-based storytelling through speech recognition technology. Our partner SAGA turned to Cortex to develop the voice recognition technology for a highly interactive, innovative storytelling kiosk for Loto-Québec. 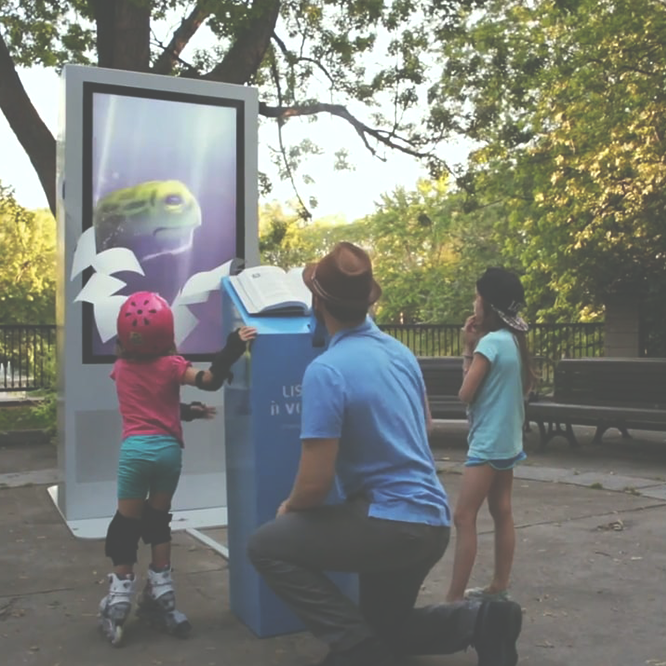 Create an outdoor interactive kiosk for people visiting Montreal public spaces where, by reading, they can unlock an immersive experience of a legend recounting the creation of the world in music and storytelling. We used our speech recognition expertise to create a system that triggers the appropriate video and music at the right time during the reading of the story. To achieve this, we had to partner up with HelloArchitekt and their Wuxia storytelling framework. The biggest challenge? Taking speech recognition outdoors, where the microphone would be exposed to the weather and all kinds of ambient noise. We developed solutions through testing, tuning and logistics intelligence. Thanks to the phenomenal teamwork of project creators, the final product won a 2015 Boomerang award (for technological creativity) and a 2016 Numix (for communication and promotion). The Numix Awards are the Digital Industry's biggest gathering in the province of Quebec and aims to reward the excellence of its content. The Boomerang awards are meant to reward the most outstanding digital content produced by the interactive communications industry & emerging tech industry of the Province of Quebec.